Geoffrey Chaucer (; c. 1343 – 25 October 1400), known as the Father of English literature, is widely considered the greatest English poet of the Middle Ages and was the first poet to be buried in Poet's Corner of Westminster Abbey. While he achieved fame during his lifetime as an author, philosopher, alchemist and astronomer, composing a scientific treatise on the astrolabe for his ten year-old son Lewis, Chaucer also maintained an active career in the civil service as a bureaucrat, courtier and diplomat. Among his many works, which include The Book of the Duchess, the House of Fame, the Legend of Good Women and Troilus and Criseyde, he is best known today for The Canterbury Tales. Chaucer is a crucial figure in developing the legitimacy of the vernacular, Middle English, at a time when the dominant literary languages in England were French and Latin. While records concerning the lives of his contemporary poets, William Langland and the Pearl Poet are practically non-existent, since Chaucer was a public servant, his official life is very well documented, with nearly five hundred written items testifying to his career. 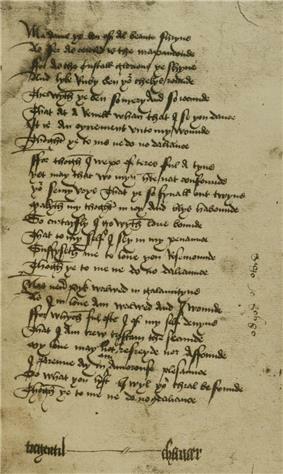 The first of the "Chaucer Life Records" appears in 1357, in the household accounts of Elizabeth de Burgh, the Countess of Ulster, when he became the noblewoman's page through his father's connections. She was married to Lionel, Duke of Clarence, the second surviving son of the king, Edward III, and the position brought the teenage Chaucer into the close court circle, where he was to remain for the rest of his life. He also worked as a courtier, a diplomat, and a civil servant, as well as working for the king, collecting and inventorying scrap metal. 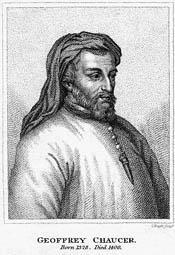 Chaucer probably studied law in the Inner Temple (an Inn of Court) at this time. He became a member of the royal court of Edward III as a varlet de chambre, yeoman, or esquire on 20 June 1367, a position which could entail a wide variety of tasks. His wife also received a pension for court employment. He travelled abroad many times, at least some of them in his role as a valet. In 1368, he may have attended the wedding of Lionel of Antwerp to Violante Visconti, daughter of Galeazzo II Visconti, in Milan. Two other literary stars of the era were in attendance: Jean Froissart and Petrarch. Around this time, Chaucer is believed to have written The Book of the Duchess in honour of Blanche of Lancaster, the late wife of John of Gaunt, who died in 1369. A possible indication that his career as a writer was appreciated came when poets laureate. Chaucer continued to collect the liquid stipend until Richard II came to power, after which it was converted to a monetary grant on 18 April 1378. While still working as comptroller, Chaucer appears to have moved to Kent, being appointed as one of the commissioners of peace for Kent, at a time when French invasion was a possibility. He is thought to have started work on The Canterbury Tales in the early 1380s. He also became a Member of Parliament for Kent in 1386. On 15th October that year, he gave a deposition in the case of Scrope v. Grosvenor. There is no further reference after this date to Philippa, Chaucer's wife, and she is presumed to have died in 1387. He survived the political upheavals caused by the Lords Appellants, despite the fact that Chaucer knew some of the men executed over the affair quite well. On 12 July 1389, Chaucer was appointed the Tower of London, and build the stands for a tournament held in 1390. It may have been a difficult job, but it paid well: two shillings a day, more than three times his salary as a comptroller. 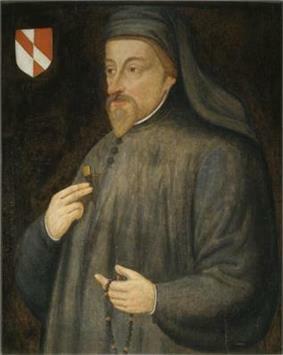 Chaucer was also appointed keeper of the lodge at the King’s park in Feckenham, which was a largely honorary appointment. Chaucer's first major work, The Book of the Duchess, was an elegy for Blanche of Lancaster (who died in 1369). It is possible that this work was commissioned by her husband John of Gaunt, as he granted Chaucer a £10 annuity on 13 June 1374. This would seem to place the writing of The Book of the Duchess between the years 1369 and 1374. 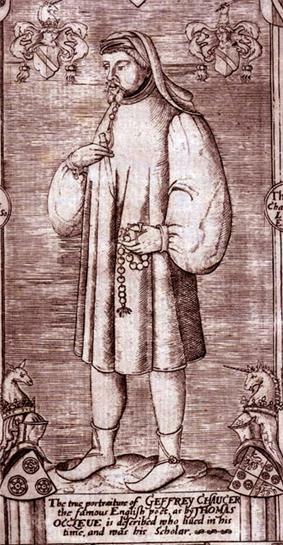 Two other early works by Chaucer were Anelida and Arcite and The House of Fame. Chaucer wrote many of his major works in a prolific period when he held the job of customs comptroller for London (1374 to 1386). His Parlement of Foules, The Legend of Good Women and Troilus and Criseyde all date from this time. Also it is believed that he started work on The Canterbury Tales in the early 1380s. 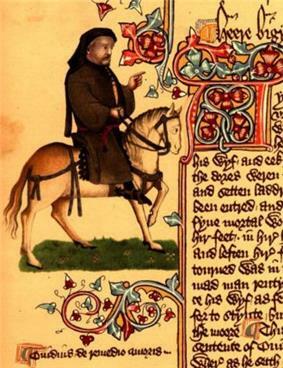 Chaucer is best known as the writer of The Canterbury Tales, which is a collection of stories told by fictional pilgrims on the road to the cathedral at Canterbury; these tales would help to shape English literature. 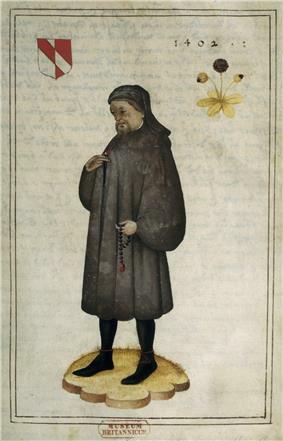 Chaucer also translated such important works as Boethius' Consolation of Philosophy and The Romance of the Rose by Guillaume de Lorris (extended by Jean de Meun). However, while many scholars maintain that Chaucer did indeed translate part of the text of Roman de la Rose as The Romaunt of the Rose, others claim that this has been effectively disproved. Many of his other works were very loose translations of, or simply based on, works from continental Europe. It is in this role that Chaucer receives some of his earliest critical praise. Eustache Deschamps wrote a ballade on the great translator and called himself a "nettle in Chaucer's garden of poetry". In 1385 Thomas Usk made glowing mention of Chaucer, and John Gower, Chaucer's main poetic rival of the time, also lauded him. This reference was later edited out of Gower's Confessio Amantis and it has been suggested by some that this was because of ill feeling between them, but it is likely due simply to stylistic concerns. 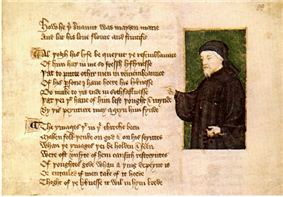 The poetry of Chaucer, along with other writers of the era, is credited with helping to standardise the London Dialect of the Middle English language from a combination of the Kentish and Midlands dialects. This is probably overstated; the influence of the court, chancery and bureaucracy—of which Chaucer was a part—remains a more probable influence on the development of Standard English. Modern English is somewhat distanced from the language of Chaucer's poems owing to the effect of the Great Vowel Shift some time after his death. This change in the pronunciation of English, still not fully understood, makes the reading of Chaucer difficult for the modern audience. The status of the final -e in Chaucer's verse is uncertain: it seems likely that during the period of Chaucer's writing the final -e was dropping out of colloquial English and that its use was somewhat irregular. Chaucer's versification suggests that the final -e is sometimes to be vocalised, and sometimes to be silent; however, this remains a point on which there is disagreement. When it is vocalised, most scholars pronounce it as a schwa. Apart from the irregular spelling, much of the vocabulary is recognisable to the modern reader. 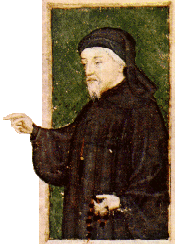 Chaucer is also recorded in the Oxford English Dictionary as the first author to use many common English words in his writings. These words were probably frequently used in the language at the time but Chaucer, with his ear for common speech, is the earliest manuscript source. Acceptable, alkali, altercation, amble, angrily, annex, annoyance, approaching, arbitration, armless, army, arrogant, arsenic, arc, artillery and aspect are just some of the many English words first attested in Chaucer. 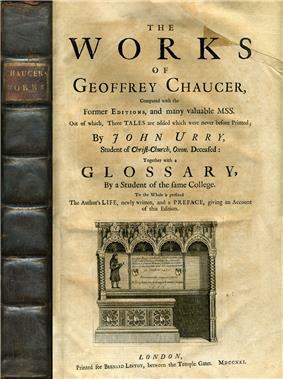 Although Chaucer's works were admired for many years, serious scholarly work on his legacy did not begin until the late 18th century, when Thomas Tyrwhitt edited The Canterbury Tales, and did not become an established academic discipline until the 19th century. Scholars such as Frederick James Furnivall, who founded the Chaucer Society in 1868, pioneered the establishment of diplomatic editions of Chaucer's major texts, along with careful accounts of Chaucer's language and prosody. Walter William Skeat, who like Furnivall was closely associated with the Oxford English Dictionary, established the base text of all of Chaucer's works with his edition, published by Oxford University Press. Later editions by John H. Fisher and Larry D. Benson have offered further refinements, along with critical commentary and bibliographies. With the textual issues largely addressed, if not solved, the questions of Chaucer's themes, structure, and audience were addressed. In 1966, the Chaucer Review was founded, and has maintained its position as the preeminent journal of Chaucer studies. A (fictionalized) version of Chaucer was portrayed by Paul Bettany in the movie A Knight's Tale. Kafka's Soup, a literary pastiche in the form of a cookbook, contains a recipe for onion tart à la Chaucer. The Book of the Leoun – The Book of the Leon is mentioned in Chaucer's retraction. It is likely he wrote such a work; one suggestion is that the work was such a bad piece of writing it was lost, but if that had been the case, Chaucer would not have mentioned it. A likely source dictates it was probably a 'redaction of Guillaume de Machaut's 'Dit dou lyon,' a story about courtly love, a subject about which Chaucer frequently wrote. ^ Power, Eileen (1988). Medieval English Nunneries, c. 1275 to 1535. Biblo & Tannen Publishers. p. 19. ^ Coulton, G. G. (2006). Chaucer and His England. Kessinger Publishing. p. 74. ^ Rossignol, Rosalyn. Chaucer A to Z: the essential reference to his life and works. New York: 1999. 72-73, 75-77. ^ Nicolas, Sir N. Harris (1832). The controversy between Sir Richard Scrope and Sir Robert Grosvenor, in the Court of Chivalry II. London. p. 404. Retrieved 2014-06-02. ^ "From The Preface to Fables Ancient and Modern". The Norton Anthology of English Literature. Stephen Greenblatt. 8th ed. Vol. C. New York, London: Norton, 2006. 2132-33. p. 2132. ^ Original e-text available online at the University of Virginia website, trans. WorldHeritage. Hulbert, James Root (1912). Chaucer's official life .... Collegiate Press, G. Banta Pub. Co. p. 75. Retrieved 2011-07-12.